The Roaring Twenties. The Prohibition Era. The Jazz Age. This year, our office Christmas party was 1920s-themed. The invitations were delivered, beautifully designed in Art Deco style. The gentlemen and ladies were instructed to pick an alias and “dress to kill” – we were going to a speakeasy. There would be an open bar, catered food, a casino, and dancing. What better way is there to end the year? 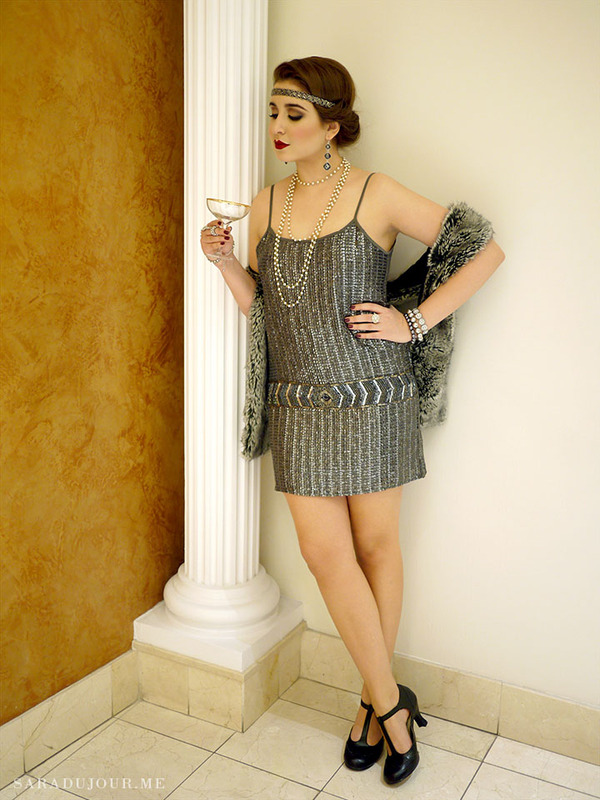 After not too much hunting, I found THE perfect 20’s dress: the Beaded Panel Sequin Dress, from Forever 21. Now that I had my colour scheme, I could plan the rest of my outfit around it. 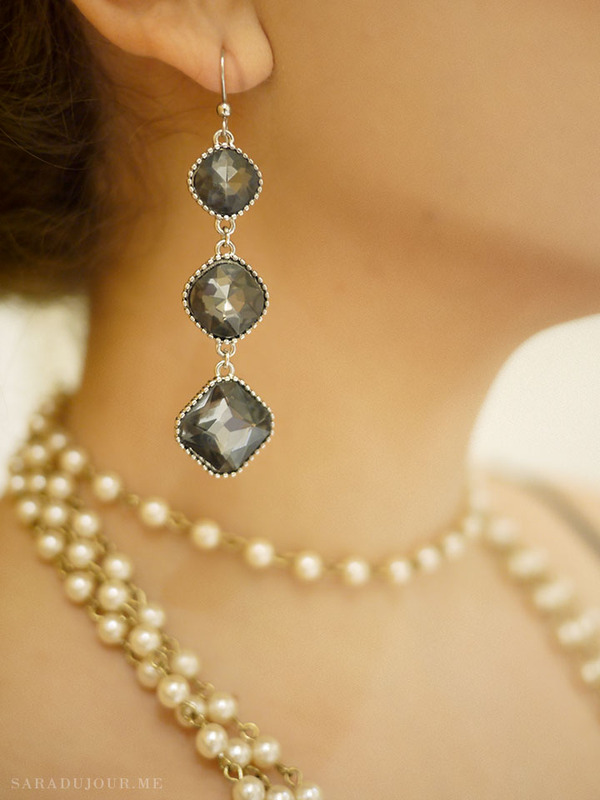 The Jazz Age was all about luxury and abundance, so it was pearls and jewels galore! They were celebrating the end of a long and brutal war, then called The Great War, a war they were certain would not happen again. Of course, now we refer to it as World War I, because there was a second, terrible war. Once again, Forever 21 pulled through for me. This rhinestone medallion hand chain is currently sold out at Forever 21, but in case they restock, here’s the link! As for the rest of my 1920s jewels and accessories, I wore a multi-strand pearl necklace I found at Forever 21 some years ago (yes, this outfit is almost entirely comprised from Forever 21 goods – should I start calling them Forever 1921? ), a glitzy rhinestone cocktail ring, grey rhinestone drop earrings, a rhinestone bracelet, two grey faux-pearl bracelets (from Aldo ages ago), and a beaded silver headband from Forever 21 I bought a few years ago. If you’re looking for 1920s-appropriate headbands, Forever 21 has a HUGE selection right now. To even further amp up the glam factor, and make it even more true to the time period, I knew I needed fur. Faux fur of course! I found this gorgeous grey faux fur scarf at my other favourite store: Indigo. Get the scarf in grey or brown. The last thing I still needed to find were the perfect 1920s appropriate shoes. In this department, I knew I had to look elsewhere than Forever 21 if I wanted historically accurate footwear. With that, my outfit was complete! 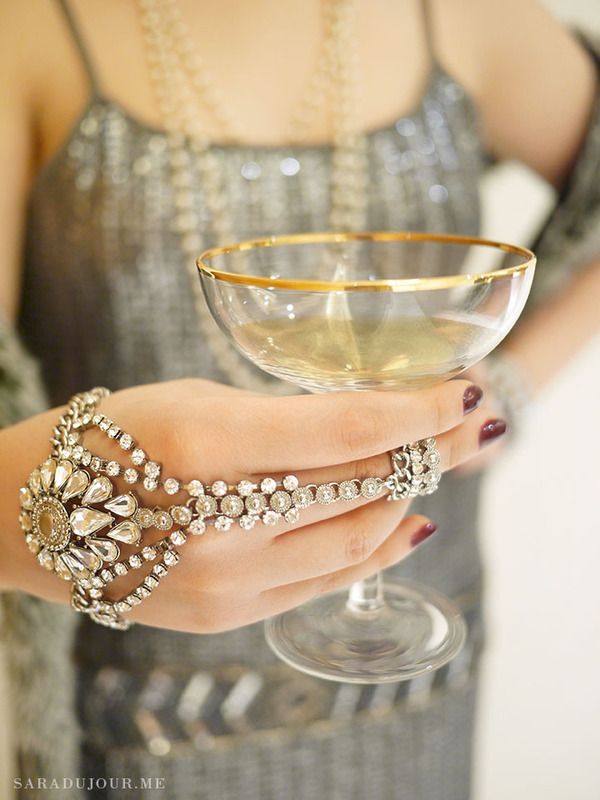 If you’re hosting a 1920s themed party yourself, these vintage gold-rim coupe glasses are just the thing for toasting. Aren’t they gorgeous? Okay, now let’s talk about hair and makeup. Enter my boudoir, dahling. 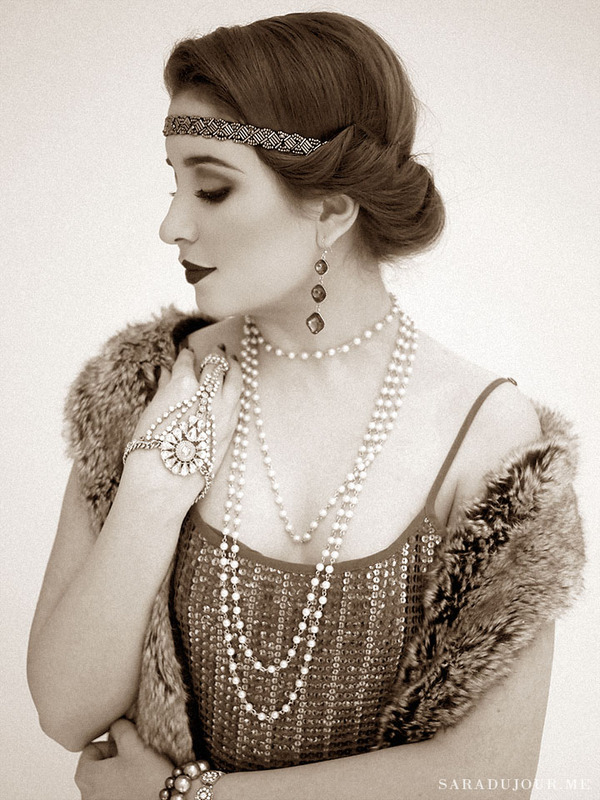 While I tried to keep the makeup as accurate to the 1920s as possible, I did take a few liberties. For example, I wasn’t about to pluck out 90% of my eyebrows and draw them back in. I love a good theme, but I’m not quite that committed! However, I did try to keep the rounded arched shape accurate to the period, and hyper extended my brows using a liquid liner that I smudged out with a bit of matte eyeshadow. As for my eyes, I did a deep matte brown smokey eye in a rounded shape. 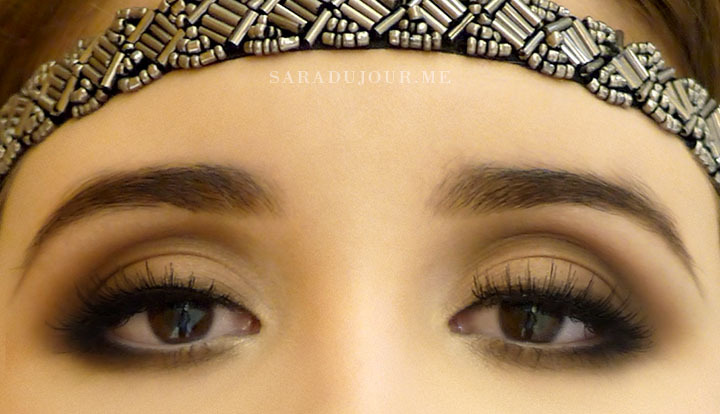 Flapper girls were all about eyelash drama, so I added a pair of long, spiky strip lashes on top to mimic their style. I also put on quite a bit of mascara on my lower lashes, which is something I don’t normally do. As a side note – I notice a lot of 1920s makeup tutorials do super black smokey eyes that rival most pandas. I looked at a TON of reference photos of women from the 1920s, and that’s not what I saw. Their eye makeup was smokey, but not pitch black. Another liberty I took was with my lip shape. 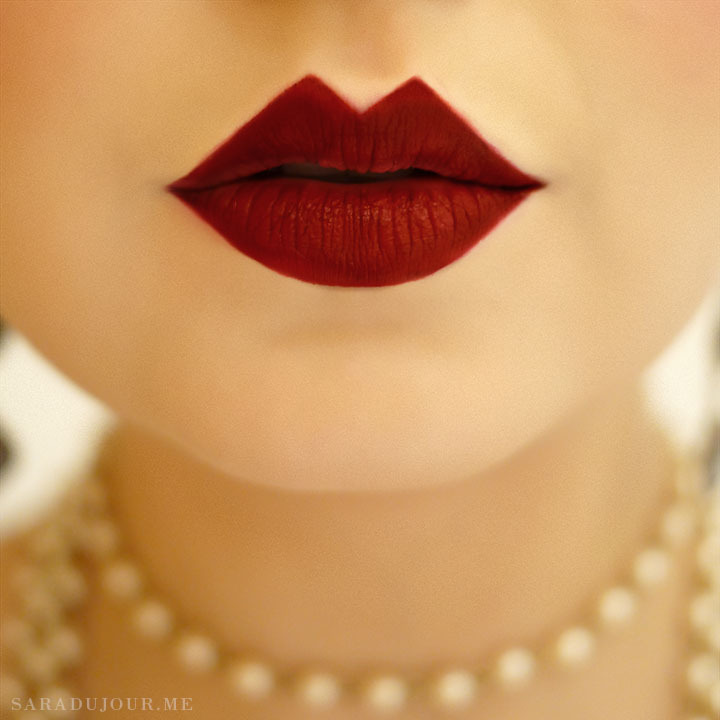 In the 20s, it was popular to make your pout look as small as possible. I personally don’t think that’s a flattering look, so while I did do the extremely pointed cupid’s bow and dark lipstick, I modernized it slightly with the lip size. To get this look, start by “erasing” your natural lip shape. Use concealer on the outer edges and set that with a powder. Then, sharpen your lipliner into a fine point and draw on the shape you want, defining the edges not as they are, but as you want them to be. For me, that meant creating two sharp points and curving my lip shape inwards. To maintain the precise shape, apply your lipstick carefully with a lip brush. I also powdered my whole face a bit lighter than usual, since that was the style in the 1920s, and applied quite a bit of powder pink blush directly onto the apples of my cheeks, another thing I don’t usually do but did for the sake of accuracy. Last but not least, the hair. Since we had about an hour to change out of our regular clothes and wind back the clocks to nearly a century ago, I needed a hairstyle I could do in a pinch. Finger waves were definitely out of the question. 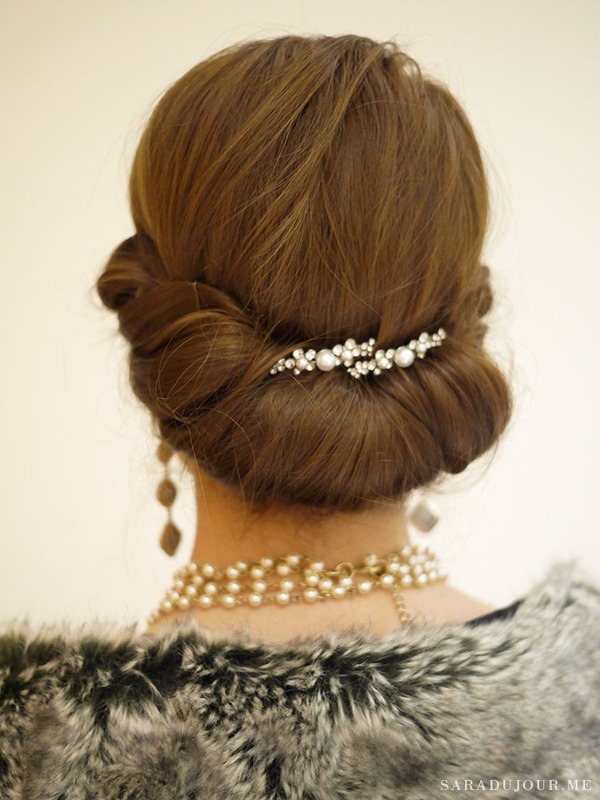 Since I have long hair and not a chin-length bob, I knew I needed to do some kind of updo. After some hair testing, which you might have seen on Instagram, I decided to do a modified version of my 1 Minute Princess Bun. << Check out the tutorial! The only differences were that I put the headband flat on my forehead rather than atop my head, and added two rhinestone and pearl hair pins to the back of the bun. They’re actually the same ones I used for my Audrey Hepburn Halloween costume! With my outfit, hair, and makeup complete, I was ready to party like it was 1924. But the glamour actually started much earlier in the day. Our morning started early, with the entire Toronto office packed up and ready to fly to Montreal for the Christmas party. It was my first time flying on Porter Airlines, and it was a wonderful experience. There were free drinks and snacks, always a plus in my book. Since there were so many of us, we practically had the entire plane to ourselves, and like a rowdy bunch of teenagers, we joked, played games, and passed secret notes between us. We arrived in Montreal shortly before noon, and before even checking into our hotel, we went to the Montreal office to meet the second half of our team. Toronto people are huggers, and Montreal people seem more apt to kiss you on each cheek. It was a bit of a culture shock for both sides, trying to play it cool and adjust. We were all in our regular, comfortable travelling clothes, but after a few hours of mingling, lunch, and team-building activities, we disappeared to our hotel rooms to transform for the evening’s festivities. By the time we were all finished making ourselves into flapper girls, the party had already begun. The DJ was playing 1920s jazz (my favourite) and I was astonished to see not only how the space had been decorated and transformed into a speakeasy in such a short time, but also: the people! Everyone had their own Cinderella moment. Oh, how I wish I could share photos of everyone in costume! They really stepped it up and held to the theme. However, as it is my company and my coworkers, I’m afraid I must keep all of that private. There were suspenders, hats, and pocket squares on the gents, and feathers, fringes, diamonds, and pearls on the ladies. Servers with trays of appetizers weaved in and out as we said hello and fawned over each other’s outfits. Everyone was so extremely kind and complimentary. They really are a lovely bunch. There was a photo booth set up with fun props, silent movies from the 1920s projected onto a wall, a DJ, and a dance floor. With the drinks flowing and the bartenders instructed to make everything a double (lord knows why! ), it wasn’t long before the twenties really got roaring. Dinner was served, followed by dancing, more drinks, more dancing, and then an EPIC Toronto vs Montreal flip cup tournament. As the night descended, it was time to play with fate and gamble. Professional card dealers set up their tables, and we were each given a fake $5000 bill to bet with as we pleased. There were all kinds of games, from blackjack to poker and roulette. Now, I’m not much of a gambler when it comes to real money, but give me fake cash and suddenly I’m a big spender. Being an all-or-nothin’ kind of gal, I exchanged the entire sum for chips and went all in on roulette. I won, doubled my money, and walked away from the table feeling very self-satisfied. As the night progressed, the music slowly inched up through the decades. While I was hearing many of my favourites from the 1920s, 30s, 40s, and 50s, it wasn’t until 1970s tunes were playing that people really began to dance. And boy, did they ever! Alcohol and a dance floor is a potent combination. While I had a fantastic time, by midnight my feet were aching from dancing and my introvert juices were well and truly drained from a day of socializing. I made my quick goodbyes as the music turned to the 90s, and headed back to the hotel, to return to the present day, put my feet up, and finally relax with a book before I closed my eyes. It’s possible I was the only person who woke up the next day without a hangover, feeling well rested. The party raged long into the night, far longer than I stayed. Apparently there was a midnight poutine bar, which must have happened moments after I left. What a shame! The morning was a blur of packing up, checking out of the hotel, and getting to the train station for the journey home. I reflected on all the fun memories from the night before and smiled as I watched the Canadian countryside whiz by. I couldn’t help but feel a bit like Owen Wilson’s character in Midnight in Paris… like I had slipped away into a secret world for the night. This post is so perfec that I might implode. You are flawless. Wow, you look stunning. This look so suits you! Amazing. So incredibly decadent! You do costumes SO well, darling. Gorgeous photos! Love the men incorporated pocket squares for that finished touch classic of the gatsby era. I love creating custom pocket squares and personalizing them. ~Sandra Li’l Inspirations. Haha that’s normal, I’m like you! But you keep the magic in your blog so that’s really good! And by the way, I think you have great skills in makeup! My goodness, you are perfect. I enjoy every one of your blog posts, Sara. You have the greatest sense of style.